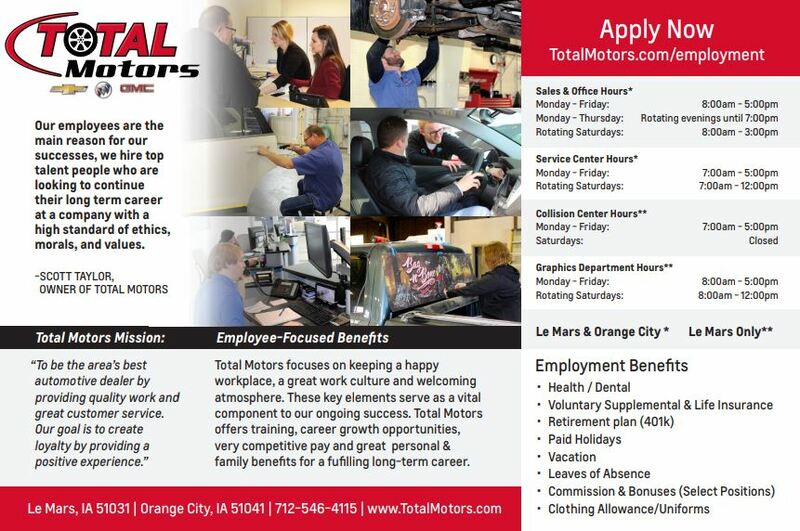 View our current open positions at Total Motors and fill out our online application today. Stop in or call us with any questions you may have. Automotive Service Technician Job Description Location: Le Mars, Iowa Total Motors is hiring for an automotive service technician in their new Le Mars, IA location. • Conduct extensive diagnostic & troubleshooting procedures to determine the sources of customers’ problems and provide accurate repair recommendations. • Perform routine automotive maintenance tasks, including oil changes, tire rotations, transmission services, replacements & flushes, air conditioner re-charges and replacements, steering & suspension systems, brake system repairs, electrical & electronic repairs, tune-ups, front-end alignments, battery installations, and headlight/taillight installations and other minor auto repair services. • Maintain a working knowledge of current industry best practices in automotive repair. Inspect vehicles for emissions and safety. • Conduct necessary repairs and take vehicles for test drives to verify soundness and correction of customer stated problem & diagnosis. • Maintain legible and accurate paperwork for both the customer and for Total of Le Mars records. • Clean and maintain the work environment to ensure equipment longevity and follow workplace safety guidelines. • Keep tools & work areas clean & free of debris & spills. • Maintain a satisfactory attendance record and meet the minimum expectations of performance standards. • Exercise cooperation & teamwork with supervision, co-workers, and customers. • Other duties and tasks assigned by the Service Manager. •MUST OWN YOUR OWN TOOLS Typical Qualifications, Experience & Skills • High school diploma/GED • Post high school auto technician program completion desired • ASE certification required • 3+ years of service technician experience • Willingness to participate in in-house and GM technician training • Ability to operate all auto repair tools • Knowledge of diagnostic tools and equipment a must What we offer: • Health / Dental • Voluntary Supplemental & Life Insurance • Heated & Air Conditioned workspace • Retirement plan • Paid Holidays • Vacation • Leaves of Absence • Commission & Bonuses • Uniforms Pay: Depends on Experience Job Type: Full-time Desired Knowledge, Skills & Abilities • Quality and safety-conscious. • Ability to be self-sufficient and maintain good attendance • Must be able to demonstrate good behavior in all aspects of the position. • Ability to follow instructions and understand product specifications. • Communication skills • Knowledge to recognize waste in supplies and machinery. • Ability to visually inspect equipment and work areas. ______________________________________________________________________________ Note: **All duties and requirements are essential job functions. All requirements are subject to possible modification to reasonably accommodate individuals with disabilities. It will be handled on a case-by-case basis. This job description in no way states or implies that these are the only duties to be performed by the employee occupying this position. Employees will be required to follow any other job-related instructions and to perform any other job-related duties requested by their supervisor. This document does not create an employment contract, implied or otherwise.